Location: At NW corner of St. Mary's churchyard, facing W to the lane. The almshouses are the last two remaining from a row known in the C19 as 'Alms Row'. A mounting-block is adjacent to the N gable. A row of almshouses was built, according to parish accounts, in 1830, replacing or adding to others to which there are earlier references. They occupied the full length of the W boundary of the churchyard. A church terrier of 1842 makes it clear they were the property of the parish and not the church, and intended for paupers entitled to settlement. That these were cottages might be doubted but they appear unmistakably on the Tithe Map (1840). They also appear on the 1863 O S map, which indicates that they then consisted of seven cottages of the size of the two presently surviving and one of double length, so they were probably at first a set of nine similar cottages. The blocked gateway to a narrow rear passage is still visible in the N wall of the churchyard. 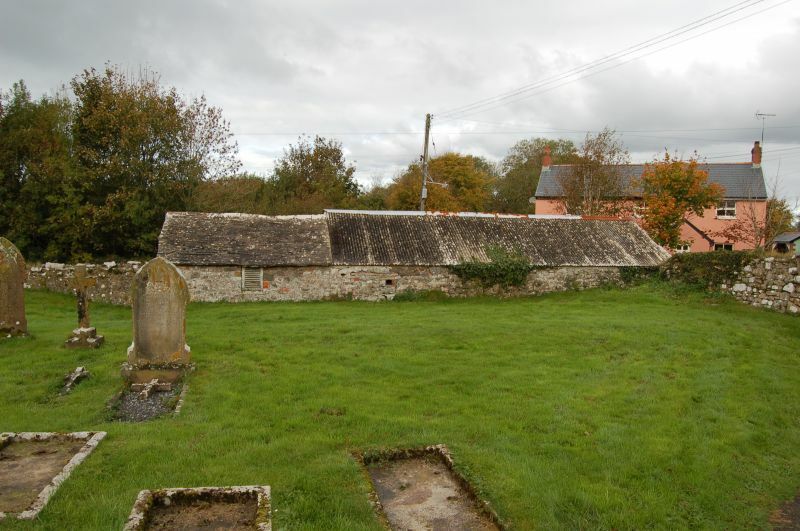 The 1841 Census has a block of what are evidently ten pauper households in Carew Cheriton, probably corresponding with the nine cottages plus the dwelling known to have existed in the undercroft of the old Mortuary Chapel. Later census evidence suggests the cottages went out of use between 1871 and 1881. All but the two at the N end of the row have been demolished. The rear passage has been filled in and the churchyard continued up to the rear wall. Of the remaining two cottages the one at the right has been altered to a shed with double doors. Two exceptionally small single-room cottages in limestone rubble masonry. The roof was evidently of slates but has been re-covered in sheeting. Each measures 3.6 m by 3.9 m internally. The roof is supported on the cross walls and on a single truss in the centre of each cottage. The trusses have a lapped and pegged collar beam. Each cottage retains its original door opening and the left cottage retains its original round-headed window opening (partly blocked). Listed as a fragmentary building of considerable social-history interest and for group value with the Church and its churchyard walls. Wall to the churchyard of St Mary's, with gates to the N, W and S.
Within St Mary's Churchyard, about 30 m NW of the Church. In Carew Cheriton, 300 m S of the A477. In the village of Carew Cheriton about 100 m N of the Church. There is a small playground at the N of the school and a garden S of the house. In extensive grounds immediately S of St Mary's churchyard. There is a gateway in the churchyard wall for the use of this house. High boundary wall to the access lane with iron gate. 100 m SW of St Mary's churchyard. Immediately west of the junction of the A477 with the A4075, on the S side of Carew Village. In the village of Milton, about 30 m N of the A477 road.